Reel screeching runs from a big brawny fish breaks tackle. Hybrids and Stripers of the Ohio River are a difficult challenge. Anglers in western Kentucky find these transplants pay big dividends in fishing action. The striper is a saltwater relative of the white bass. It resembles the white but is more elongated and less compressed with a nearly straight back. The color of the striper is a dark greenish to bluish on top with sometimes a brassy tinge that becomes lighter on the sides. The underside is silvery. Most prominent are the seven to eight narrow stripes along the sides going lengthwise from which they gain their name. Generally they reach a weight of about 5 pounds by their third year. Fish in the 20 plus range are common. 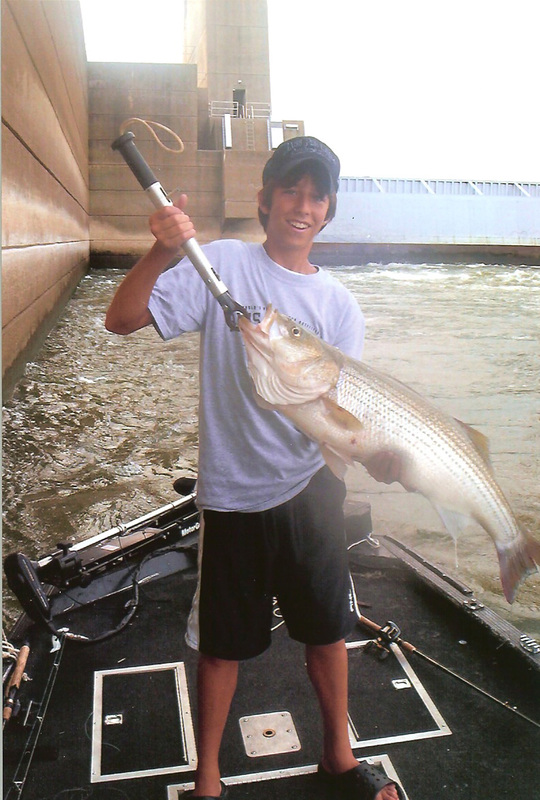 The introduction in the 1960′s of striper fry into Lake Barkley created a fishery that is flourishing. It was part of a number of such stockings across Kentucky and parts of Tennessee. Some larger fish went into Kentucky Lake. Over time they moved out of the lake and down river into the Ohio River. Additional stocking by the Kentucky fisheries people added to the population. Feeding on gizzard shad they provide a service to the other populations of game fish in the area. They feed on the larger shad which the bass and catfish ignore. 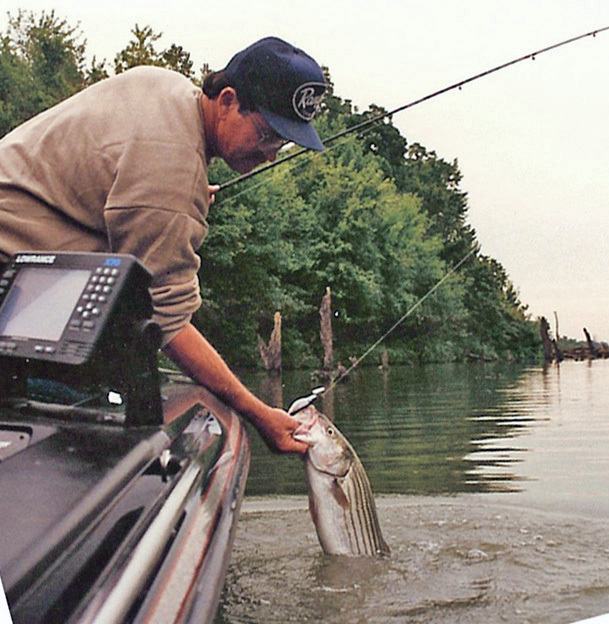 Stable water levels are important to striper fishing success. Both Kentucky and Barkley Lakes vary in water level beginning in April through September. The Tennessee Valley Authority controls the levels. Although water levels can vary from day to day generally they are stable from October through March. 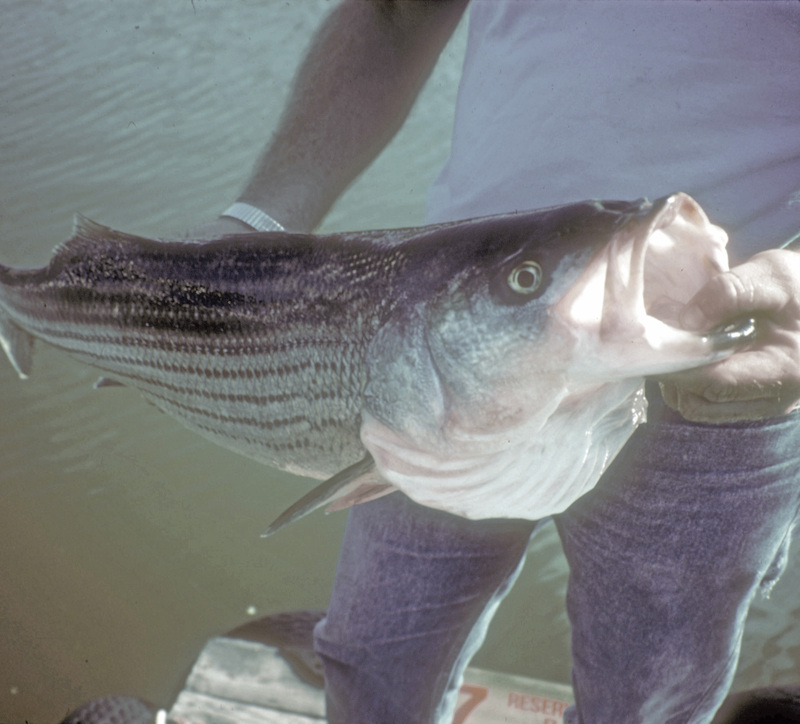 Over the years stripers have made their way through the Kentucky dams at the north end of the lakes and established strong populations in the downstream waters especially those below Smithland Dam. Although stripers spend most of the year roaming deep open water in pursuit of shad, they seem to be more concentrated in the spring. Stable water conditions coupled with spawning shad cause the stripers to move to the more shallow water and dam tailwaters. Anglers move in and cast both lures and live bait into the fast moving waters. Heavy bass gear will handle these fish. A medium or heavy rod and bait cast reel with 15 plus pound monofilament line will work well. A 7-foot rod with a flexible tip is a good choice. The flexible tip allows fish to grab the bait without meeting with a lot of resistance before they are safely hooked. Live bait, either shad or skipjack are productive bait. The rockfish’s voracious eating habits allow it to gobble up the bait before the angler is even aware of the strike. A 2/0 to 4/0 Kahle or circle style hooks hold the live bait. Some rockfish take topwater lures such as the Cordell Redfins trolled in the early morning hours. Later in the day one can move up close to the dams and locks and cast large jigging spoons and Shad imitations. Large jigs (l ounce) with plastic bodies in pearl or white colors seem to work well. Electronics locate large schools of fish as they chase the shad. Once a school is located anglers probe it by jigging, trolling lures or with live bait on downriggers. The jigging is more exciting and productive. Downstream from the dams or locks, rip rap banks are most productive. The gizzard and threadfin shad are attracted to the plankton and algae between the rocks. The stripers follow them in and feast on the shad. Another good downstream location is the sheltered side of islands. Small islands deflect current. As the bait fish move into eddies to rest, the stripers will be waiting for them. Some stripers are found on the upstream end of islands but not as many as will be found downstream. Generally stripers are anywhere that there is a current break and a good food supply.